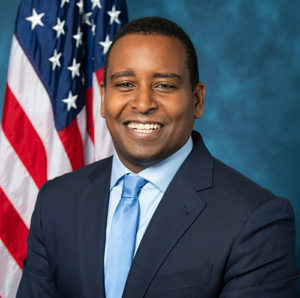 Freshman Rep. Joe Neguse (D-Boulderish) scored a big committee assignment when it was announced late Tuesday that he was selected to serve on the House Judiciary Committee. The House Judiciary Committee is where any impeachment proceedings would begin. Though Democrats are not generally expected to pursue impeachment of President Trump, the House Judiciary Committee is also a prime launch point for any number of investigations into the current administration. For better or for worse (in this case, probably better), Democratic members of the committee will have a significant media platform with which to raise their national profiles. Colorado is well-represented on the House Judiciary Committee; Congressman Ken Buck (R-Greeley) was already an existing member. Depends on the meaning of the word "well" doesn't it? or what is meant by "represented." It is a good day when a POC whose parents were immigrants is seated on the Judiciary Committee while the white supremacist from Iowa is kicked off. These two pieces of news made my day. And, yeah, M.J. (below), he’s going to be good at this, and the people of Boulder and Larimer Counties will be well served. "The Goose" is the real deal – Obama-level oratorial skills, smart as a whip, warm personality. Listen to him speak sometime. Here he is speaking about the shutdown.